"The hunger march" on Boston Common. Communists and sympathizers with placards and banners announcing their demands, stage hugh demonstration on historic Boston Common. So surges restless, discontented humanity under the leadership of crafty demagogues who seek only the overthrow of the American Republic. Federation of Labor, with the object of turning it into a mass revolutionary instrument for the overthrow of the Government of the United States and the building of a soviet régime in its stead. During this period the American labor movement has constituted the front line trenches between Americanism and communism, and the loyal American labor leaders, and rank and file of the American Federation of Labor, have borne the brunt of the attack and have been America's first line of defense. "If it were not for the fact that the American Federation of Labor, under the patriotic leadership of William Green and his predecessor, Samuel Gompers, have refused to compromise with the communists in the United States, who have been trying to 'bore from within' in order to gain control of the labor unions, communism would be a serious threat to American industry. Great credit should be given to the American Federation of Labor for combating and exposing the aims of the communists to undermine our republican form of government and destroy our industries. "While the communists so far have been unsuccessful in their plans for 'boring from within,' and 'capturing ' the American Federation of Labor, they have succeeded in weakening and virtually breaking up and destroying a number of the important unions of the Federation, notably in the garment, needle, textile, and mining trades. 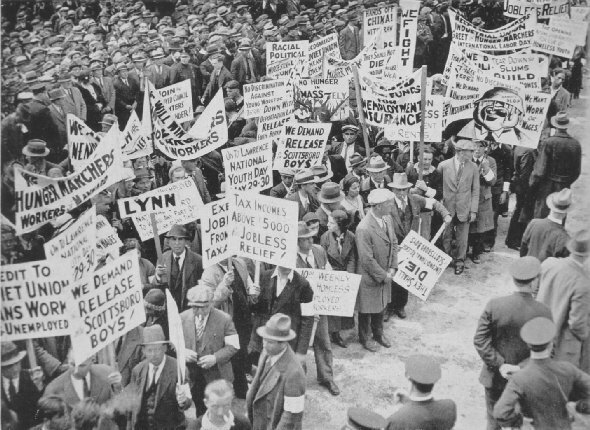 In the coal-mining fields of Pennsylvania and Illinois, in the garment and fur trades in New York City, in the mills at Passaic, N. J., in the woolen textile mills in New England, centering at New Bedford, and in the cotton mills of the South, centering at Gastonia, the communists have fomented strikes or gained the leadership of strikes already called. These strikes were most violent and destructive, culminating in riots, violence, destruction of property, assaults, and murders, necessitating the calling out of troops; and a virtual state of civil war in the various sections ensued. "The communists in the United States have adopted a definite policy of conducting an intensive and extensive campaign among the youth of America for the purpose of spreading revolutionary doctrines and preparing the young generation for militant participation and leadership in the much-proclaimed revolution against our republican form of government, which is synonymous in the eyes of communists with capitalism. "The activities of the communists among the youth of America are at the present time among their most important objectives due to the desire to train Amcrican-born and American-speaking boys and girls in the principles and aims of communism."